You may know what ITIL is (a global efficient IT framework), and the purpose of it, like reducing costs while better servicing your customers, but where did ITIL come from? ITIL was born in the 1980s when the British government realized the quality of their IT services just wasn’t up to scratch. The Central Computer and Telecommunications Agency (CCTA), later renamed the Office of Government Commerce (OGC), was tasked with creating a set of standard practices that could more cohesively unite the IT systems of both the public and private sectors. The aim was to develop a more efficient framework and a more financially viable way to use IT resources. The earliest incarnation of ITIL was released at the end of the 1980s. This early version was titled the GITIM, Government Information Technology Infrastructure Management, and while it’s very different to today’s ITIL, they both share the goal of offering improved support and delivery. There was widespread adoption of the framework from government agencies and private sector companies across Europe and, by the early 1990s, ITIL began to change the face of IT, not only in the UK and Europe, but around the world. ITIL soon grew to a 30-volume strong catalogue that recommended and provided IT best practices that focused on and catered for client and business needs. At the turn of the millennium, the CCTA changed into the OGC. The year 2000 also saw Microsoft adopt ITIL as the foundation for developing their Microsoft Operations Framework (MOF), along with the first major change to ITIL, resulting in ITIL v2. The new version was focused on making ITIL more accessible to the masses and arranged the 30-volume framework into nine related categories. Over the next few years, ITIL became the standard for IT best practice and the most widely used IT service management tool in the world. 2006 saw another nod towards ITIL’s commitment to being user friendly with the release of the ITIL Glossary. The following year saw the third version of ITIL published, one with more emphasis on IT business integration and which was centered on the concept of service lifestyle structure. ITIL v3 condensed 26 processes and functions into just 5 volumes, and, upon launch, acquired the name ITIL Refresh Project. In 2011, AXELOS released a revision of ITIL that resolved errors and inconsistencies with V3. In this updated version of the 2007 edition, 5 volumes make up the ITIL service catalogue: ITIL Service Strategy, ITIL Service Design, ITIL Service Transition, ITIL Service Operation and ITIL Continual Service Improvement. This quintet of ITIL volumes now forms the basis for all ITIL best practices across the globe. Since 2013, ITIL has been owned by AXELOS Ltd – a joint venture between Capita Plc and the British Government’s Cabinet Office. The current version of ITIL launched in 2019. V4 has more practical guidance on how to use ITIL, particularly in collaborative environments. This makes it easier for organizations to align ITIL with DevOps, Agile, and Lean work methods. With V4, ITIL adopted more of a holistic philosophy towards service management, making it more broad and inclusive for the modern IT environment. Three decades on and ITIL remains the gold standard for IT globally, thanks to its ability to deliver real business benefits by adapting to business needs. As part of ILX Group, a leading international of professional learning and consulting solutions, ITIL Training is bringing the many benefits of ITIL to businesses across the country. Get in touch to find out more about our ITIL training courses. 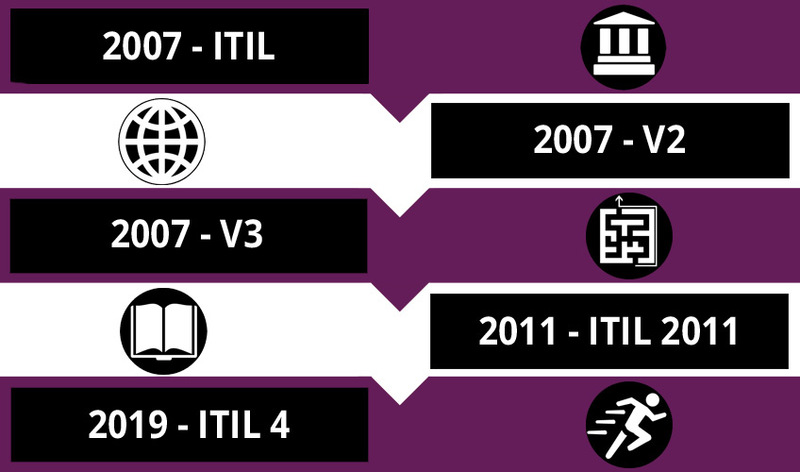 See the full history of ITIL infographic here.